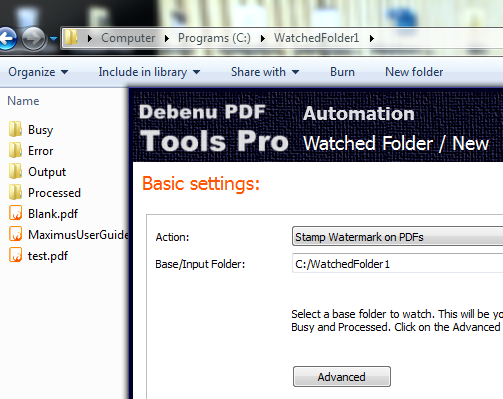 A Watched Folder is a collection of folders dedicated to automating your PDF workflow. The folder that you have chosen to watch is the Base Folder (also known as the Input Folder) and it contains sub-folders which are created automatically as required when processing your files. The base Watched Folder is actively monitored for new files. Once a file has been processed it is saved to the Output Folder and the original copy of the file is moved to the Processed Folder. 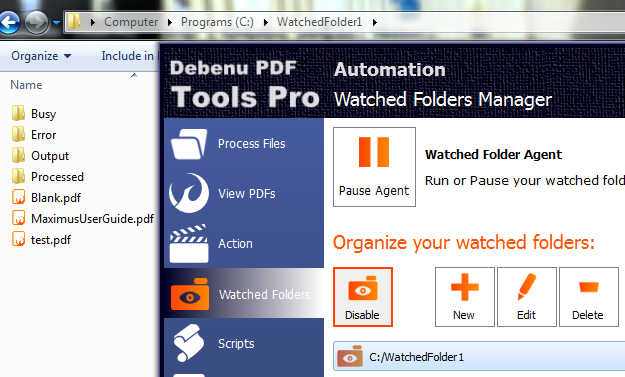 Watched Folders are designed to run silently in the background independent of the main Debenu PDF Tools Pro application.